Library of Pizza Related videos on this page. 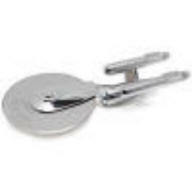 The Star Trek Pizza Cutter: You need to see it to believe it! Star Trek meets pizza therapy! Best Pizza Books: The Holy Trinity plus one, of Pizza Books is reviewed here: Peter Reinhart's American Pie, Ed Levine's A Slice of Heaven, Penny Pollack and Jeff Ruby's Everybody Loves Pizza and pizza, by Diane Morgan and Tony Gemignani. 500,000 + Pizza Lovers Can't Be Wrong- But I want a Million! Help me with my pizza mission. Watch this video and please share it. Thanks. Best Pizza Movies of All time: I review the Best Pizza Movies ever made. My choices are certainly outside of the pizza box. I also give an honorable mention to Julia Robert's Mystic Pizza. Jon F's Famous Cheese Pizza: This is totally radical pizza. Very unusual. Revealed exclusively here at Pizza Therapy for the first time on the planet! Simply amazing Cheese Pizza! Best pizza in Rhode Island. Difara's Video Series: Nobody makes pizza like Dom Demarco. A dedicated pizzaiolo. Simply amazing pizza. Di Matteo Pizzeria: Jonathan Goldsmith takes us on a journey to Naples to visit the master pizzailoi from Di Matteo. Enzo Coccio Discusses La Pizzeria Notizia from Pizza Therapy. Master pizzaiolo from Naples talks about his own pizzzeria. Grilled Lobster Pizza: From Jen, a foodie with a message: I eat. I cook. I laugh. I LOVE. How to peel garlic- Related to onions, shallots and leeks, garlic is a magical ingredient. Here is an easy step by step method to peel garlic. How to Make Pizza Dough from pizzatherapy.com: In this video I will show you a simple method to make pizza dough. I don't pretend that it is the best recipe, but it is a good starting point to get some experience to make pizza dough. How to Shuck an Oyster: Learn how to easily an safely shuck an oyster. Josh shares with us his favorite oyster opening secrets. Grown fresh from Noank Pond. How to Cook Steamed Clams: Easy step by step directions to steam clams. Ingredients to make pizza dough: This video discusses the simple ingredients you need to make pizza dough. You can make a great dough with simply, flour, salt, yeast and water. There are other optional ingredients that I use. Inferno's Wood Fire Pizza: For the best pizza in Hawaii, I recommend Inferno's The pizza is cooked in a wood fired kiawe wood fueled oven. The pizza is simply outstanding! Italian Pizza Video: Step by step how to make pizza. Easy and its fun. John Arena Pizza Class, Volume 1: John Arena, The Pizza Professor teaches how to make Pizza at Metro Pizza in Las Vegas. Jon F. Discusses Grandmother's Pizza: Jon F. takes the Pizza Promoter into his kitchen to talk about pizza made by the Pizza Lady form Pawcatuck, Connecticut. This pizza reminded me of pizza I had as a kid in Rhode Island. Keste Pizzeria Interview with Roberto Copuruscio: Roberto explains his inspiration for pizza and why he continues to share his pizza secrets. He also discusses his pizza school. Neapolitan Pizza from Sky: Sky journeyed to Italy to reasearch Spiritual food. Here is her report from Naples on the state of pizza in Italy. This is an eye opening film! Caputo Flour Factory: Go with Sky as she visits the Caputo Flour factory. An amazing journey and discovery about flour. Pizza Making and Making Pizza: A great step by step video on making pizza. I love this video. Naturally Risen: One of the most incredible pizza films ever made. This film by Michael Evans, honors Anthony Mangieri and his Pizzeria. Una Pizza Napoletana. If you like pizza, you need to watch this film..
Pepe's Video: Come with me as I visit Fank Pepe's Pizzeria Napolitano. See an actual Pepe's pizza being made, and listen to an exclusive interview with Frank Pepe grandson, Gary Bimonte. Also get up close and personal with the legendary coal fired oven. Pizza Therapy Supports Japan: Please help our friends in Japan. They need our help. Sally's Video: This is an exclusive interview with Flo Consiglio, wife of Salvatore Consiglio. Sally's looks very much the same as it always has. Some things never change. For that I am grateful. Thanks Flo. Una Pizzeria Di Napoli: Here is a step by step video of how to make pizza, directly from Italy. Caputo Flour Factory from Sky Dylan Robbins. An inside look at how the best flour in the world is made. 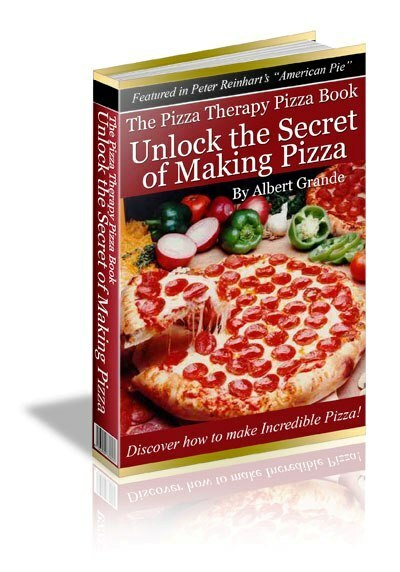 The True Story of Pizza Therapy: Here is the back-story behind Pizza Therapy. America's Stories Visits Pepe's and Abate's on Wooster Street. An incredible film about pizza. Grilling Pizza with Kathy Lentine- Kathy shows you an easy method to grill pizza. Perfect Slice: I do not really see the need for this product. But what do I know? Peter Reinhart: Preparing the Hearth for Baking Bread: A wonderful companion to his book: This new book by Reinhart is incredible! Peter Reinhart's Artisan Breads Every Day . Peter Reinhart: Shaping Boule: In this video Peter talks about how to work with a very wet dough. Peter Reinhart: The Stretch and Fold Technique: This video may be my very favorite in the entire series. Peter Reinhart reveals his stretch and fold technique. Poached Pears: Learn Elliot's personal recipe and watch a video of Chef Keith. Singing Pizza Commercial from Tabasco: Who knew a pizza could sing. In four part harmony, no less. Pizza Therapy Dot Com for Sale? : The truth is that everyone has a price...or is there more to this story? Searching Google for the Best Pizza in the World: The shocking results are in. The proof is in the Search Engine. Find the Best Pizza in the World, here. Where is the best pizza in the World? �A Peacock in the Land Of Penguins� : If you are interested in creating a workplace where new ideas and innovation can flourish, take 3 minutes to watch this inspirational movie. Get FREE SHIPPING and SAVE 25% Off Sitewide at Vistaprint! Limited Time Only!